After several big snowfalls, and last night’s 8-incher, we decided that before tackling the digging out process, we would go on a short walk in the woods. 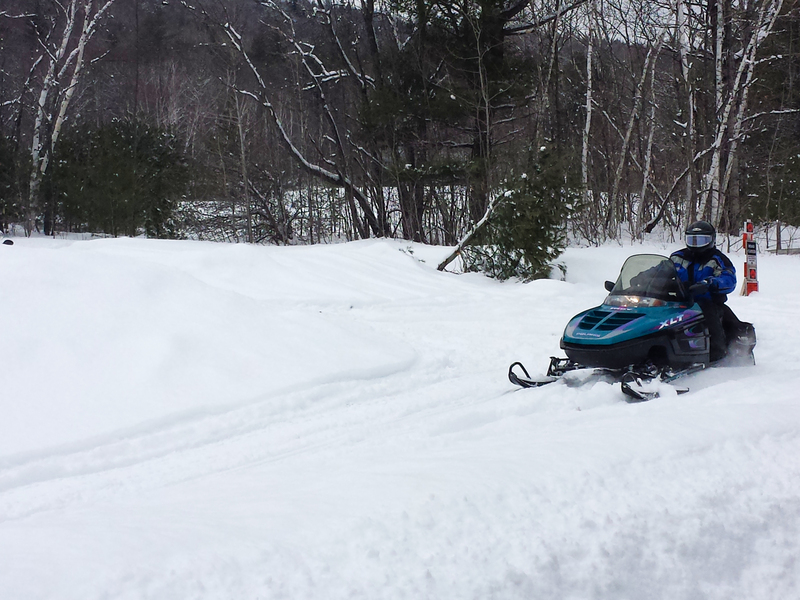 We live near several snowmobile trails that except for weekends are barely in use. 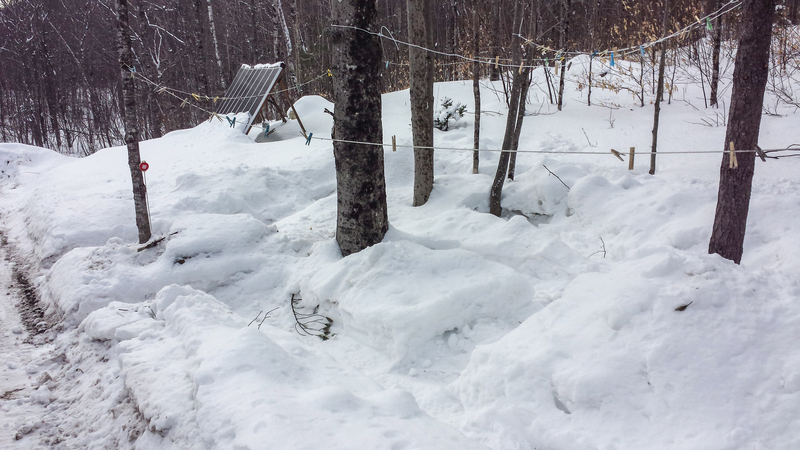 Because these trails are groomed and compacted regularly, it means we have many options for walking in the woods in remote areas, but don’t require snowshoes. On Sundays we might see as many as 10 – 15 snowmobilers. I have mixed feelings. I am certainly appreciative both to the state of Maine and private snowmobile clubs for maintaining the snowmobile trails. It’s a lot of work and expense to keep them groomed right after a snowfall, packing down the snow and making sure the trail is free from debris. These trails go on for hundreds of miles, right to the Canadian border, and it enables people to enjoy the woods and go places they couldn’t reach otherwise. 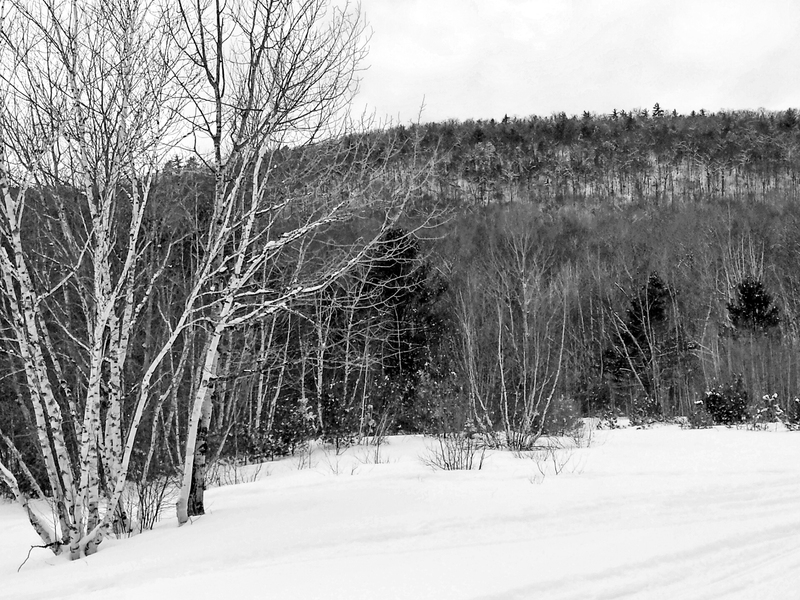 Snowmobilers also bring in a huge amount of revenue for local businesses and the State of Maine, from rentals, sales, motels, restaurants, gift stores, gas stations, apparel stores, and even repair mechanics. 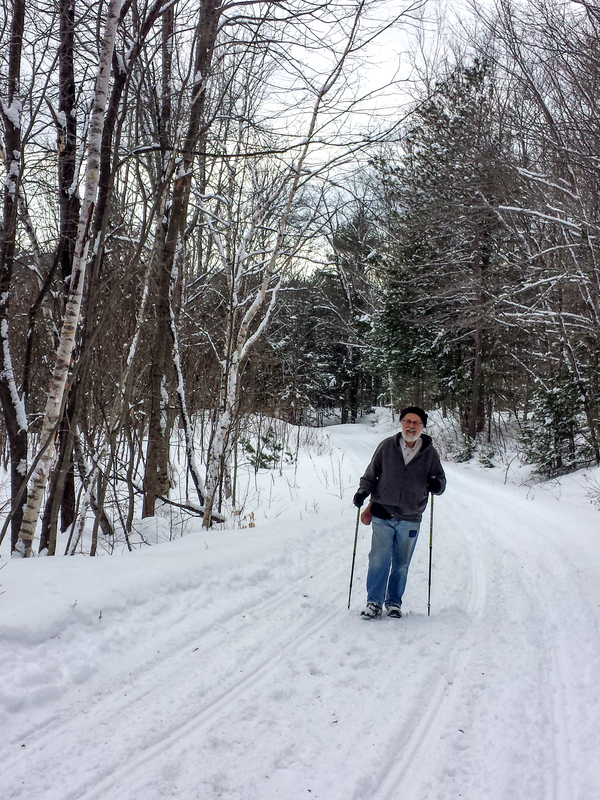 For people who don’t have snowmobiles, the trails provide a place to go hiking, cross-country skiing, and snowshoeing. Caveat: proceed with caution. Snowmobiles are basically motorcycles on skis. They go fast, and some trails are narrow. It is the snowmobilers, not other outdoor adventurers, who have the right of way, so if you hear a snowmobile approaching, you had better step aside off the trail – – and do so quickly. The downside to snowmobiles is that they are noisy and their exhaust is smelly. It seems counter to enjoying a beautiful day in the woods to be creating so much noise, when one of the things I like best about our area is the pristine quiet. But since there are easier, quicker places to reach, we really do get a minimum amount of trail use by snowmobilers in our area, so the benefits of trail use for hiking outweigh any negatives. The ethereal beauty of our woods near our home. 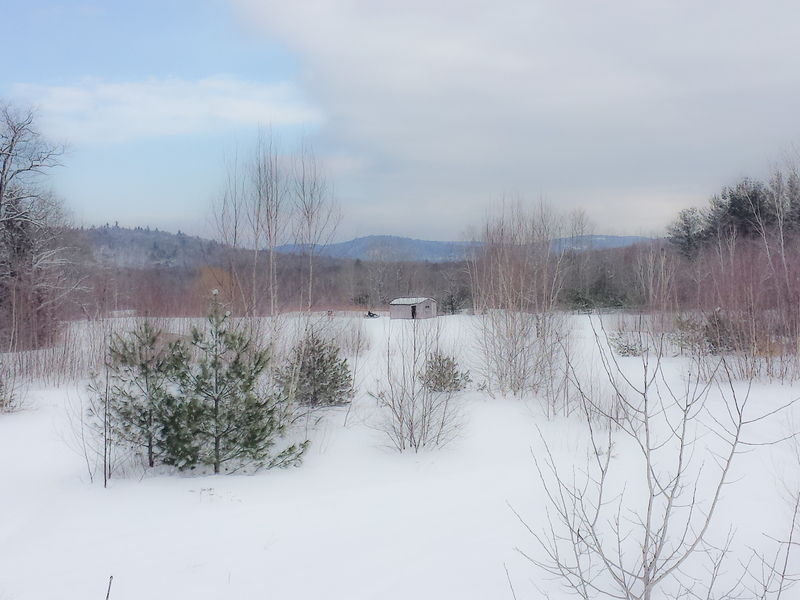 If you look carefully, you will see a snowmobiler to the left of the shed. 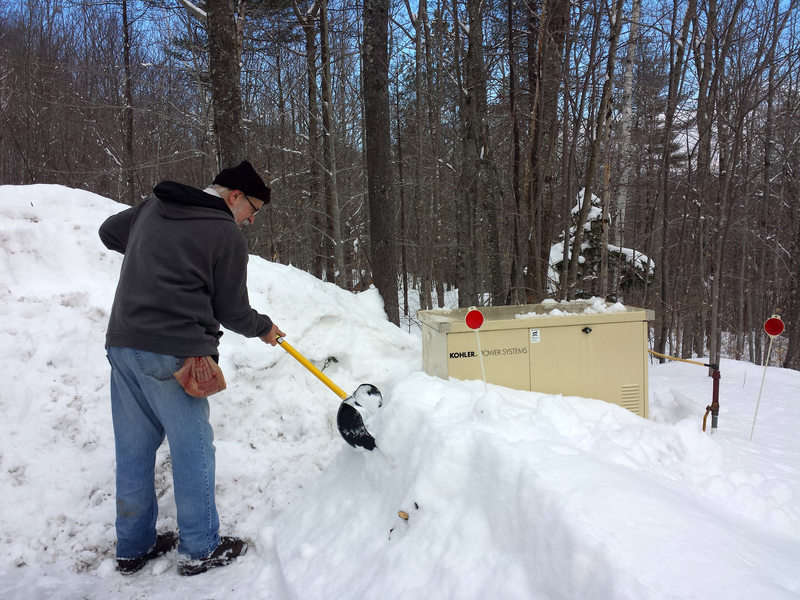 When we returned from our 3-mile excursion, we decided to get to work digging out from the previous night’s storm. First we tackled the mailbox. Two years ago I had a welder create the frame for our mailbox so that the mailbox could be hung from chains, thereby averting knocks and destruction by passing snowplows. 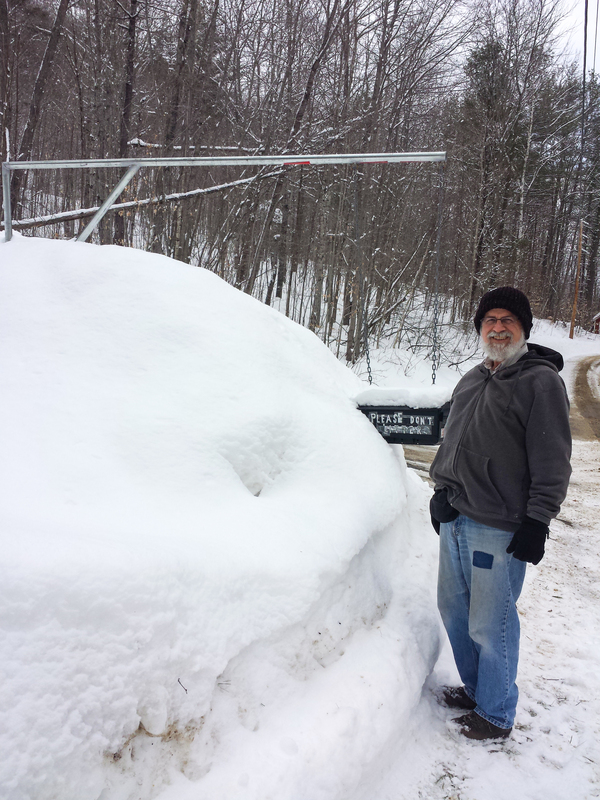 The top of the pole is 7′ tall, so based on these pictures you can see that we’ve gotten a lot of snow so far. 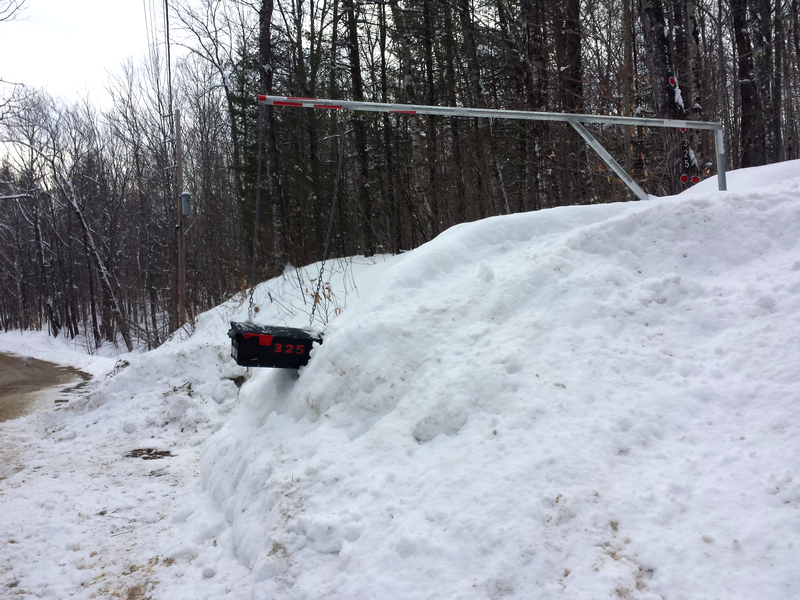 In fact, even though I try to keep the mailbox area clear so that our mail lady won’t have any difficulties delivering our mail, if we get much more snow in the coming weeks I won’t have any place left to shovel the snow away from the mailbox. 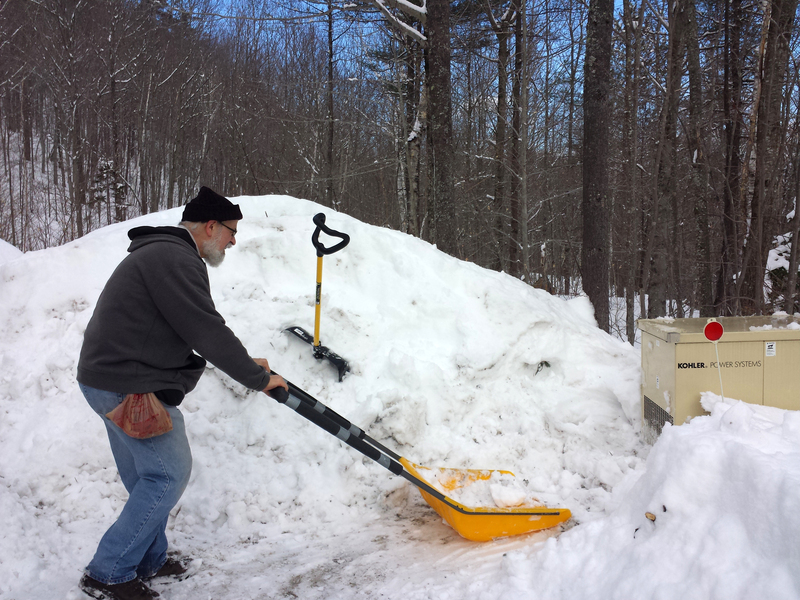 Even though our Plow Guy snowplows the 500′ long driveway following a snowfall of at least 4″, there is always plenty snow clean-up that remains for us to address. 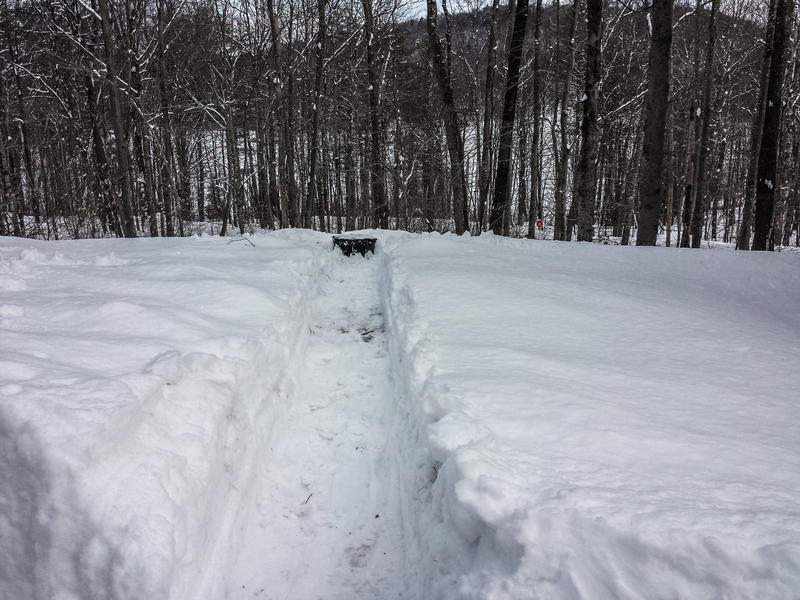 First my husband cleared a path to our 1000-gallon buried propane tank. 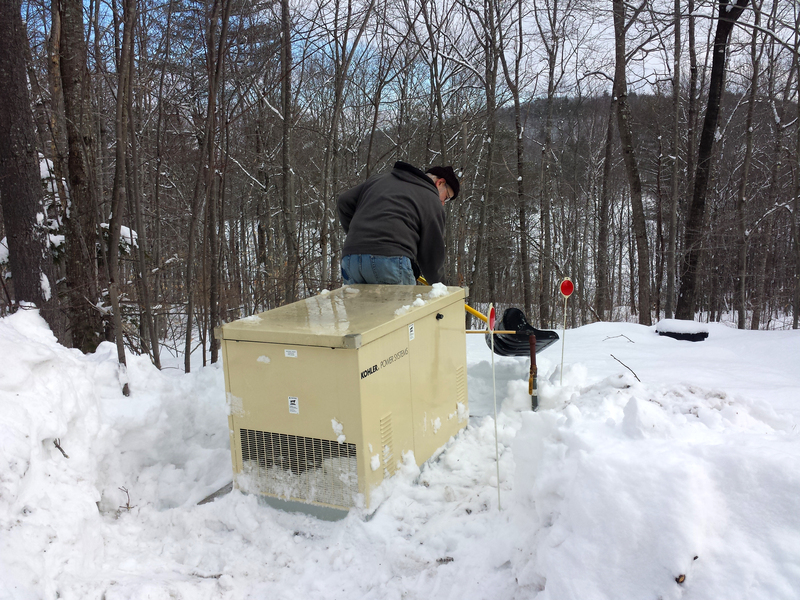 Next he removed the snow from our emergency back-up generator, ensuring the air vents and access to the doors were clear. He also made a path to and under the laundry lines, since even on freezing days, I hang freshly laundered clothes out to dry. 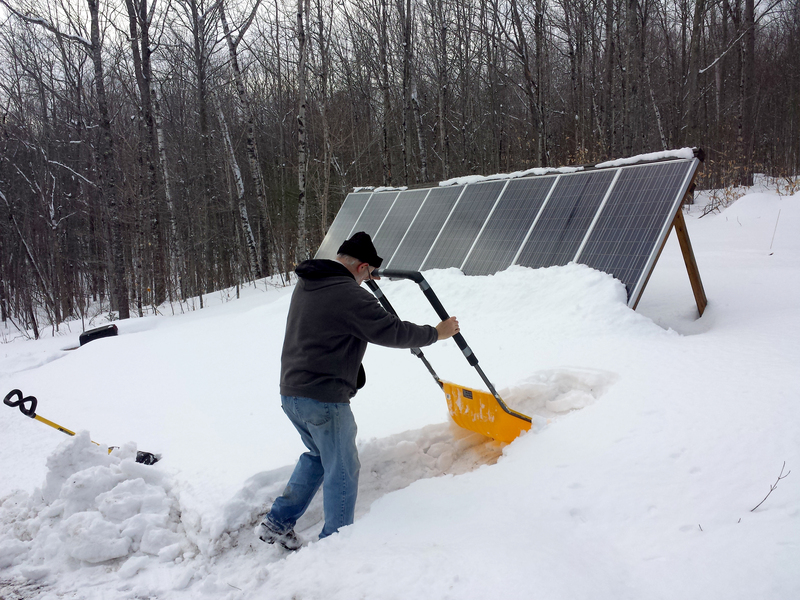 He shoveled a way to the solar panels so I could brush off the snow from the glass with our corn broom. We have two kinds of snow shovels. One is actually a snow pusher, as seen here. It can move huge amounts of snow without killing one’s back. Our regular shovel, seen to the left of the picture, is good for tight spots, icy or heavy, wet snow that the snow pusher can’t handle. This has been a cold and snowy winter. We’ve used quite a bit of wood. But no worries: I have several more cords of wood sitting under tarps alongside the wood shed, which have been drying out for 2 to 5 years. 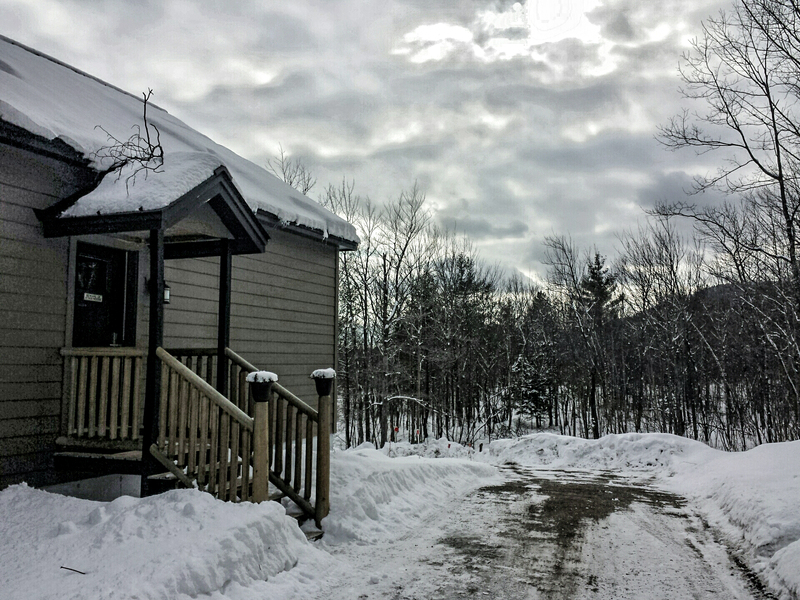 The wood was harvested from our property starting six years ago, when we cleared part of the land to make the driveway, the foundation for the house, and a sunny, open field in front of the solar panels. 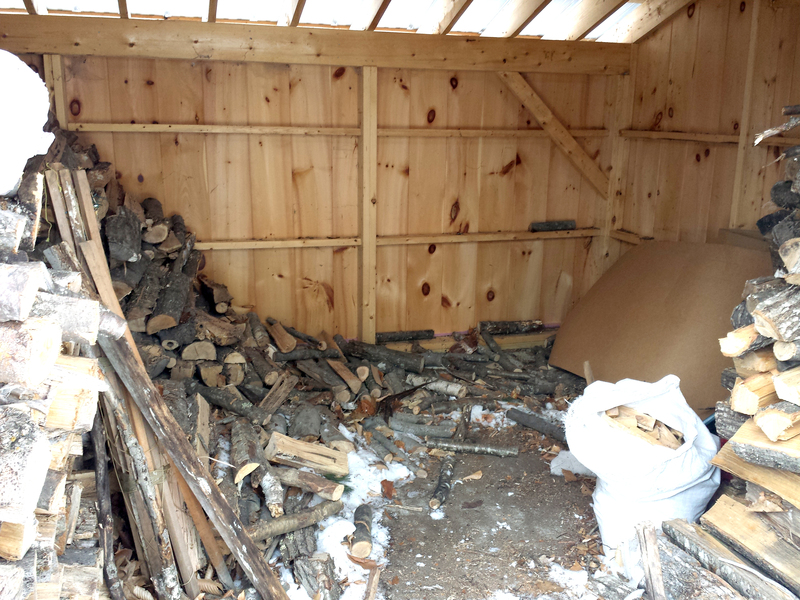 This summer I will be lugging and stacking wood into the wood shed, getting ready for the Winter of 2016. The 12′ x 16′ wood shed can hold 5 – 6 years’ worth of stacked wood. Our super-efficient Hearthstone soapstone wood stove and excellent interior insulation means we’ll only use about 2 cords of wood this year (about 2 pickup truck loads). The white bag in the shed contains kindling. I got this huge bag for cheap from a furniture shop – inside are the discarded raw wood ends that are perfect for fire-starting. Otherwise, I gather kindling from broken branches right on our property. Of course, we are far from done with shoveling. Another storm is headed our way Wednesday and a 1′ snowfall is predicted. It would not be unusual to still be shoveling in April. It may sound like we need to get our heads examined, but both of us truly enjoy our outside chores in the cold temperatures. Not only does it beat going to the gym, it makes us appreciate how blessed we are that we are still up to the task. My bad. 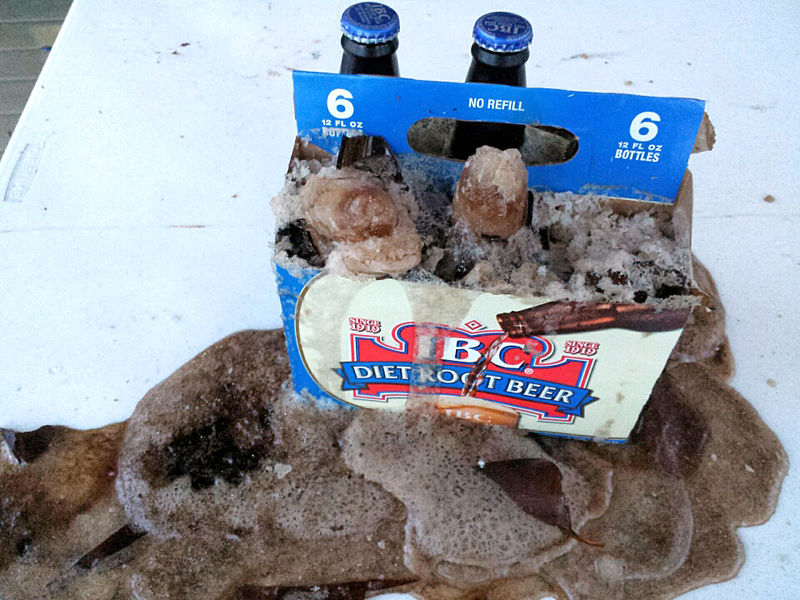 I left a six-pack of root beer on the porch last night in sub-zero temperatures. I woke up to the sound of exploding glass. Until it warms up a bit, I can’t even clean up the soda spill which is frozen solid and stuck hard to the table.